Don't you tell me about Africa. I know all about suffering in Africa! Little attempt is made to disguise the stage origins of Polanski's latest, but I found that to be part of the pleasure. The number of times that Kate Winslet and Christopher Waltz attempt to leave Jodie Foster and John C Reilly's apartment becomes predictably amusing. The premise; the son of Winslet and Waltz hits the son of Foster and Reilly with a stick, busting his teeth. We join the aftermath, as the parents discuss events in an initially civilised manner. But relations quickly deteriorate, as congenial exteriors reveal not particularly likeable individuals underneath. The casting is the greatest asset here, allowing the film to sail over some fairly predictable circular arguments and plot devices (vomiting, indulgence in alcohol, the fate of a mobile phone). Foster is scarily convincing as an uptight finger-pointing liberal while Waltz walks away with all the best lines as the distracted, blasé attorney. 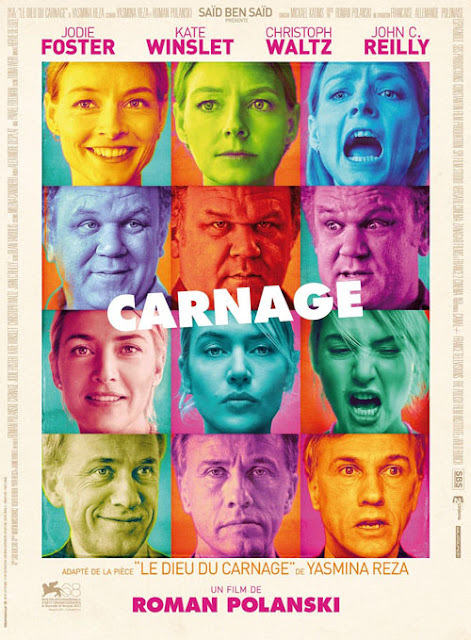 Winslet and Reilly are good too, the former expelling a hilariously powerful projectile vomit while the latter is at his best when his easy-going exterior drops to reveal some decidedly un-PC views. At only 80 minutes, it knows the best moment to exit the proceedings; something of a rarity.